“PX Pages” refer to the default and customized pages provided with the Niagara Framework. There are standard PX pages, such as alarm consoles, weather, etc., and there are typically a large number of custom pages provided by the installer or systems integrator as well. These custom pages can often provide detailed and animated views of the status of specific equipment, such as air handlers, lighting controls, etc. 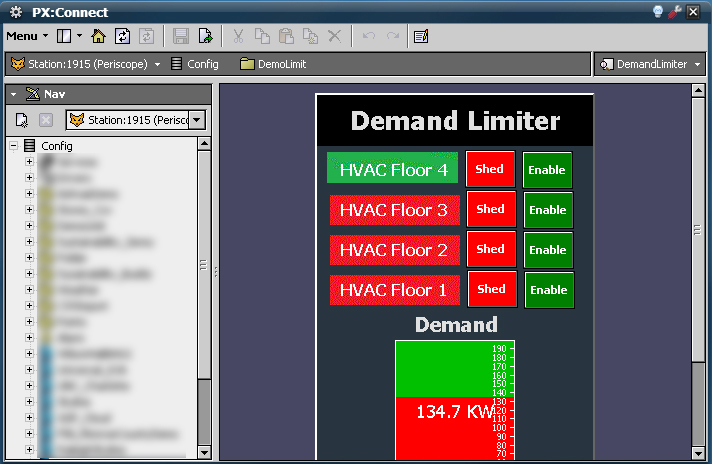 The PX: Connect Viewlet enables the user to add any of these additional Niagara PX pages to their dashboard, allowing them to integrate previously created operational graphics into their dashboard. This eliminates the need for a user to navigate outside of Periscope’s browser to check on comfort issues, alarms or to change building equipment schedules.